This incredibly funny and over the top musical portrays the story of a slave who comes up with a genius plan to win his freedom. The film is set in the days of the great Roman empire, specifically during the reign of Emperor Nero. Pseudoius is a slave who is lacking in the categories of intelligence and street smarts. The only thing Pseudoius desires in life is freedom from his unbearable slavery to a wealthy couple. One day he conjures up a plan to earn his freedom. Pseudoius notices that the couple's son named Hero is in love with his neighbor, Philia. Noticing this great opportunity, Pseudoius decides to play matchmaker with the ambition that Hero will be so grateful, that he will convince his parents to let Pseudoius free. 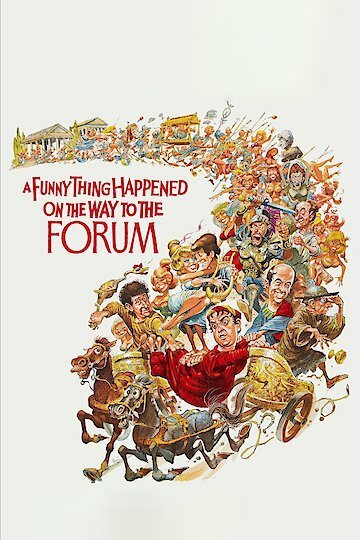 A Funny Thing Happened on the Way to the Forum is currently available to watch and stream, download, buy on demand at Amazon Prime, Amazon, Vudu, Google Play, FandangoNow, iTunes, YouTube VOD online.